This laboratory provides a technical research and graduate teaching concentration on the use of geophysical survey and remote sensing techniques to aid in archaeological fieldwork. A full complement of geophysical instrumentation and computer processing support forms the nucleus of a new Archaeological Geophysics Laboratory housed in the William S. Webb Museum of Anthropology. Faculty, students, and research staff in the department are the primary users of this equipment; however, researchers in other UK departments and other Kentucky educational institutions may have access to this equipment for research purposes. Geophysical survey refers to multiple techniques that measure variation in near-surface physical properties of the ground, such as mineral magnetics, electromagnetic conductivity, electrical resistance, and ground density. 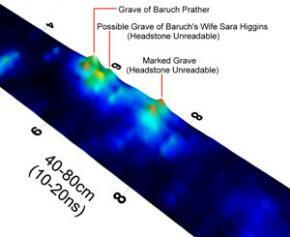 Buried features, like stone or brick foundations; variation in sedimentary structure and ground moisture, such as in archaeological deposits, trenches, mounds, and burial vaults; and other subsurface features have characteristic signatures that geophysical instruments can detect. Based on the measured variation in geophysical properties over a site, buried features and deposits can be accurately located and mapped without extensive excavation or other ground disturbing methods. Researchers can use the information acquired during a geophysical survey to design cost-effective excavation strategies, reveal large-scale community patterning, and identify culturally sensitive human burial sites. Three dimensional representation of graves in the Prather Cemetery used as comparative samples for a Ground Penetrating Radar (GPR) survey at Raven Run Nature Sanctuary, Fayette County, Kentucky. Henry, Edward R. 2006. A Geophysical Survey of the Prather Property at Raven Run Nature Sanctuary, Fayette County, Kentucky. Kentucky Archaeological Survey Report No. 139. Lexington, Kentucky. Geonics EM38™ Ground Conductivity Meter with a DL720 datalogger. Geoscan Research RM-15™ Advanced Resistivity Survey System with a MPX15 Multiplexer and PA20 Multiprobe Array. Malå GeoScience RAMAC/GPR™ with a single channel CUI control unit. Malå GeoScience RAMAC/GPR™ with a multi-channel CUII control unit and XV11 monitor. 100-800 MHz shielded antennas for use with either the CUI or CUII control units. Dell Latitude D820 Computer Notebook for in-field data acquisition. Dell Precision 690 Computer Workstation dedicated to processing and visualization of geophysical data. Geoplot 3.0 Software (Geoscan Research USA) for processing conductivity, resistivity, and magnetometer data. Ground Vision™, Easy 3D™, and RadExplorer™ Software (Malå GeoScience) for acquisition, processing, and interpretation of GPR data. GPR-Slice Software (Geophysical Archaeometry Laboratory) for 2D and 3D visulization of GPR data. Structural mapping of prehistoric shell midden sites in the Green River region of central Kentucky. Structural mapping of coastal shell midden sites and an early Spanish Mission site on Sapelo Island, Georgia. Community structure of late prehistoric Fort Ancient sites in the Bluegrass and Eastern Mountains of Kentucky. Identification of fortifications, prison foundations, and cemetery areas at Camp Nelson Civil War Park, Kentucky. Geophysical survey of the Olmec site of Tres Zapotes, Veracruz. Geophysical survey of pueblo sites in Grand Canyon National Park, Arizona. 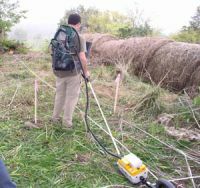 Geophysical survey of buried shell midden sites in the Falls of the Ohio River region of Indiana and Kentucky. Geophysical survey of West Virginia frontier forts. 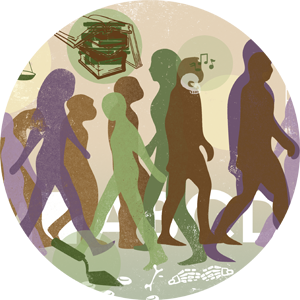 For further information on the Archaeological Geophysics Laboratory, e-mail Dr. George Crothers or call 859-257-1944.